Indian Foreign Minister Sushma Swaraj shakes hands with North Korean Foreign Minister Ri Su Yong, New Delhi, India, April 13, 2015 (AP photo by Manish Swarup). 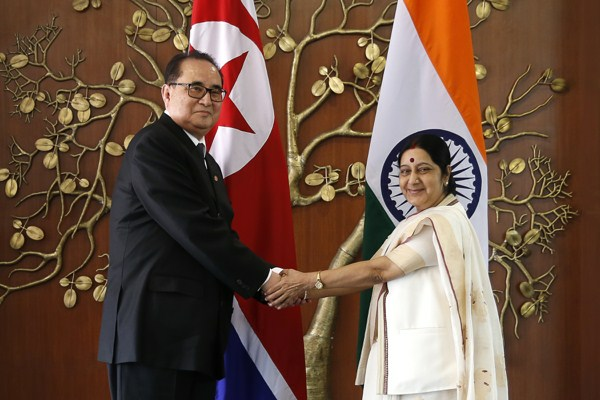 Last week, North Korean Foreign Minister Ri Su Yong was in New Delhi for talks with Indian Foreign Minister Sushma Swaraj on North Korea’s nuclear program and to request additional humanitarian assistance. In an email interview, Ankit Panda, an associate editor at The Diplomat, discussed India’s ties with North Korea.